Another important component of scoring high in IELTS is the ability to demonstrate a large variety of tense and aspect in IELTS Writing and Speaking. If one can show equal comfort in using different sentences in all present, past and future tenses along with the aspects with time like simple, continuous, perfect and perfect continuous varieties, the band score using goes higher. Let us look into it in detail. In English, as the tense or time is concerned with the action, the verb changes its form depending on the tense of the sentence. To rephrase, the form of the verb exhibits the tense of a sentence. The structure of Simple Present sentences are S+V+O. When the action is continuing at a given moment. When the action has been completed. It shows the perfected/completed action in the present time period. When the action shows a time frame from past till present. Rohan has been postponing his trip. The structure of Perfect Continuous sentences are S+has/have+been+V-ing+O. 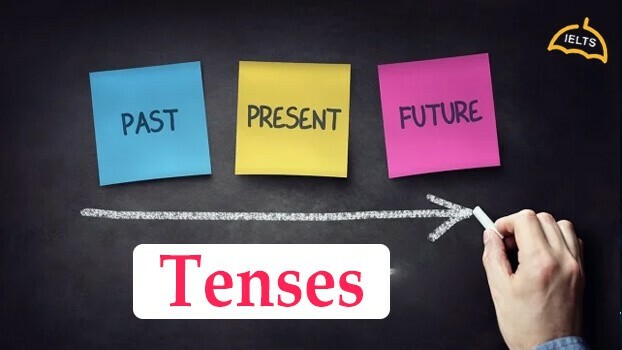 Past tense is further divided into four types the same way as the present tense. When the action happened before the present. I wrote a letter to the authorities. The structure of Simple Past sentences are S+V(past)+O. When the action was continuing at a given moment in the past. I was writing a letter to the authorities. I was watching the movie yesterday. The structure of Past Continuous sentences are S+was/were+V-ing+O. When the action has been completed in the past. It shows the perfected/completed action. I had written a letter to the authorities. Ravi had taken the thief to the police. The structure of Past Perfect sentences are S+had+V(participle)+O. When the action shows a long time period in the past. I had been writing regular letters to the authorities. The guide had been showing around the fort to the visitors. “I had completed my work in the morning” is grammatically correct. I will write a letter to the authorities. India will soon emerge as a superpower. The structure of Simple Future sentences are S+will/shall+V+O. I will be writing a letter to the authorities. India will be emerging as a superpower soon. The structure of Future Continuous sentences are S+will/shall+be+V+O. The appropriate use of tenses is not a magic trick that dawns upon us in a single day. So one should practice enough to excel in its usage. Make sure you put in a lot of time practicing tense, the materials of which are available online. Good job, please keep continuing. i love your way of explaining..